In most countries of the world in the course of various coins. Like it or displace them any kind of electronic money and plastic cards, coins still circulated widely. In terms of circulation coins of Russia is no exception and, although not so long ago withered away due to the meager cost of the famous penny metallic money in Russia exist, however, in other denominations. Coin tradition in the world are not much different. The only thing that changes is the design of coins and their composition, rather, the alloy from which they are made. A long tradition worldwide of steel alloys based on copper. Nothing surprising in this, since initially after the transition from minting money out of precious metals in coin and have to reign it copper. As a bargaining chip copper money existed during the times of ancient Rome. Modern Russian coins are made of any single metal or alloy. A lot depends on the year of issue and denomination. Coins of one penny and five cents were made of steel with the subsequent covering Melchior, representing a so-called clad coins. The bulk of the coins of ten and fifty cents issued before 2009, was made of a special copper-zinc alloy. But since 2006, these coins began to produce steel clad with red brass alloy, created on the basis of copper with zinc and other elements. Coins, higher in one and two rubles were originally made from Nickel silver. This lasted until 2009, but later they began to be minted in steel and covered with Nickel. Five-ruble coins prior to 2009 were minted from copper with a Nickel silver coating. Only since 2009, began production of steel five-ruble coins with a coating of Nickel alloy. Ten ruble coins in 2009 minted from steel with a brass coating. But the Russian coin is not always gravitated to the gland. There was a period when mass was minted quite complex in production, but spectacular bi-metal coin. So, in 1991, that was minted ten-ruble coin, in which the inner part was made of a copper-zinc alloy, and outer Nickel silver. 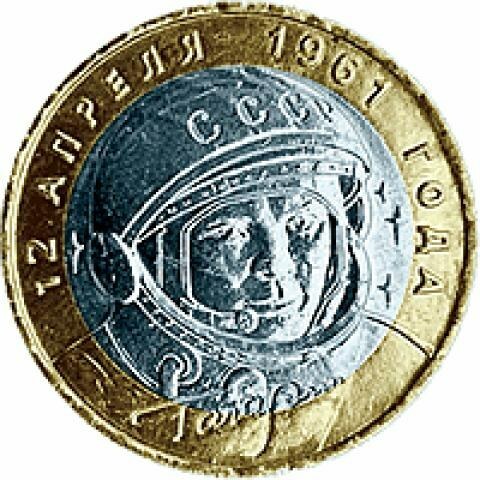 After the termination of the minting of this coin in 1992 was produced in mass-circulation bi-metallic coin of fifty and one hundred rubles. Currently, in addition to the mass of coins are minted periodically collectible, gift, anniversary coins. For them to use gold, silver, the same bimetal with the only difference that the modern commemorative coins have a ring from a copper-zinc alloy and a core of Nickel silver.